Preferred Habitat: Beaches and salt marshes. 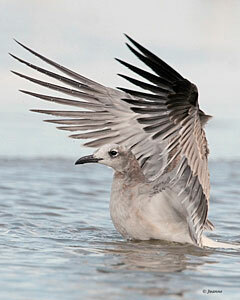 Notes: Laughing Gulls are medium-sized gulls that are gray above and white below. Summer adults have a black head, broken white eye ring, red bill and legs. Winter adults have a white head with pale gray streaking on the back, black bill and legs. Immature birds are browner overall and more subtly patterned than adults; they take 3 years to gain adult plumage. Laughing gulls are the most common gull species breeding along the Texas coast in summer; 68,000 pairs nest in Texas each year. Colonial nesters, Laughing Gulls nest on the ground on saltmarshes, on islands, and on sandy beaches along the gulf coast. Young are born in June or July and when they are able to fly well, they head to the Pacific Coast of Mexico or Central America. They return to Texas to breed when they are 3 years old. 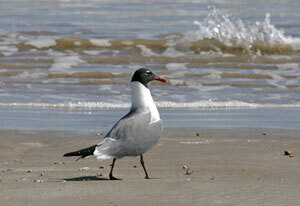 Laughing Gulls are very vocal birds. Their species name is cachinnans which is Latin for “laughing aloud”. Their common call is a loud, descending series of laughing notes, ha-ha-ha-ha-ha.